The RiLL Sapphire 500 is a laser rich in pedigree, and class, always at the centre of attention due to its rare and expensive blue laser light. With its hypnotic 500mw blue laser the RiLL Sapphire 500 will turn heads wherever it goes emitting a rare and warm bright blue laser light. 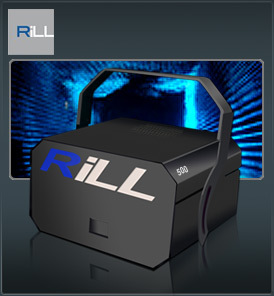 Put the RiLL Sapphire 500 together with the PM 2000 laser controller and the possibilities become endless, stunning graphics, animation and text make the RiLL Sapphire 500 like all gems rare and absolutely priceless. • The PM2000 is a new high specification, laser display controller. It has been designed for professional live shows, where it is important to get the effects that you need, when you need them. With PM2000 you can take laser display frames "as is" without any modification from many different popular laser display formats, and do what you want with them using modulations in real-time. The modulation engine is extremely advanced and supports many features, including the traditional 'rotate', 'flip', 'zoom' and 'rove'. [read more...] If you combine the oscillation engine with the modulation engine, you'll be absolutely amazed at what you can achieve!